A few years ago, my spiritual director challenged me to list three things I was grateful for, daily, for 30 days. There were a couple of other parts to this exercise, but it was aimed at helping build an “attitude of gratitude.” I’m happy to report that it stuck with me. One of the instructions that helped overcome my perfectionist and self-criticism tendencies was the instruction to not worry about missing a day – just pick it up again. The 30 days didn’t have to be consecutive. Psychologists have only recently begun to look into the benefits of cultivating gratitude, but early findings are encouraging, confirming traditional teachings. In two long-term studies of college students and gratitude, researchers in England found that the more often and intensely people feel grateful, the more social support and lowered stress and depression they believe they have. This makes sense because anything that builds social support will almost surely help us cope with stress and do better overall. Rejoice always, pray continuously, give thanks in all circumstances – 1 Thessalonians 5:16-18. When we are more grateful, we tend to see the world in a more positive light, which protects against stress and depression. We also make our own world better by thanking helpful people – expressing gratitude – because they become more likely to offer us more support. Does making gratefulness lists work? Yes, says a recent study titled, “Counting Blessings Versus Burdens.” Across three groups who either kept lists of hassles, things they were grateful for or ways in which they were better off than others, the people who tracked gratitude ended up with a more positive outlook. The gratitude list-makers were also more likely to offer emotional support to others – another example of gratitude encouraging social support. They also spent more time exercising, slept better, had fewer physical complaints and were more optimistic. Daily gratitude tracking was more powerful than weekly. Another study, on religious involvement and gratitude, showed that attending church more often leads to more gratefulness. The increase was greater for people who believed that God works with them to overcome difficulties and challenges. This makes perfect sense through the lens of stress as a threat or challenge. When we feel ill-equipped to deal with a situation, our bodies have a “threat” stress response, raising the levels of hormones and neural pathways that cause long-term health problems. On the other hand, if we see the same situation as a challenge – because, in this study, we believe God is with us – our bodies react differently, in a way that doesn’t jeopardize long-term health. Daily well-being increased with daily gratitude practices for Vietnam veterans with PTSD. 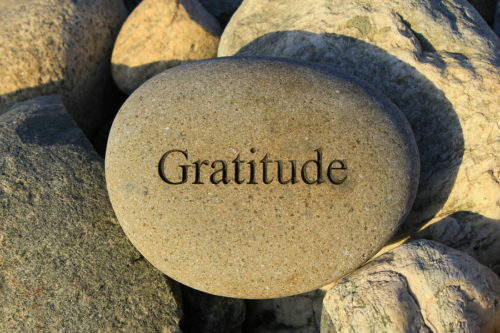 Gratefulness helps people stick with self-directed interventions to improve their body image. Gratitude in children was related to positive functioning after the 9/11 attacks. People who are more grateful tend to recall more positive life events, which helps make them more positive. Writing about how a good thing, such as finding a romantic partner, might never have happened, increased their positive outlook – to the surprise of the writers. Writing a letter of gratitude, about a time you were at your person best, identifying character strengths all contributed to happiness and positivity, while reducing depression. Previous articleYoga, one of these days! Next articleWe are so desperate to connect with others that we will risk our own lives and those around us to exchange 140 characters while driving.